Back in 2010, Motorola and Verizon decided to release a special R2-D2 version of the Motorola DROID 2. The phone was loaded up with Star Wars content, and did resemble R2-D2, but only if the droid was flattened by a steamroller. These days, the R2-D2 DROID is considered more of a collector's item, and with the December 18th launch of The Force Awakens creeping up on us, we wouldn't be surprised to see the price of the phone getting pushed up by nostalgic Star Wars fans. 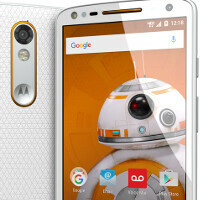 Speaking of Star Wars, starting tomorrow Verizon customers can create their own Motorola DROID Turbo 2 Star Wars edition through the Moto Maker tool either online, or inside Verizon stores. That means that DROID Turbo 2 buyers can select from new colors and backs based on five characters from the upcoming film: Poe Dameron, Rey, BB-8, a First Order Storm Trooper and Kylo Ren. Star Wars character wallpaper will be available to download from an exclusive Google Play app. The pricing for the Star Wars customization will be close to what the more expensive options cost for the DROID Turbo 2. And no, using a Jedi mind trick is not going to get Verizon to lower the price, or send you one for free. What you might win for free is one of 12,000 opening weekend tickets to The Force Awakens that Big Red is giving away. To enter, you need to go to Verizon's Theory Wars website (Theorywars.com) where Star Wars fans can talk about their expectations for the new movie. The Drod R2-D2 looks cool. Yep it does! Something tells me that the BB-8 version is gonna sell Alot of units! a true storm trooper phone. i'm in love hahahaha oh verizon, if only i were okay with being on your network. It's carrier unlocked, all of their LTE devices are. It's just the wallpaper or some other skins? So fake Verizon. Something tells me that the BB-8 version is gonna sell Alot of units! Love Star Wars. Why you hook up with Verizon? The Sith of the mobile carriers. My wife and I ordered two Droid Turbo 2 phones. (She works for Verizon Corp.) and I must say I REALLY wanted to love these phones. We were going from Note 4's to the T-2's and I was looking forward to having a Motorola product again. Good thing we didn't trade in our Note 4's because the T-2's were a huge disappointment. The 20MP camera's should have been excellent, they weren't. I couldn't figure out the focus system and everything was always blurry. The screen was no where near as bright. You cannot be on the phone and send or receive a text or be on the internet at the same time (but I still can on my old Note 4!!!). We kept them for 2 days and returned them. I really wanted to go back to Motorola, but I'll wait for the Note 6 to come out later this year and stay with Samsung unless Motorola gets their act together. I'm willing to give them one more chance but the T-2 isn't it. To focus on those phones you have to put your finger on the ring in the center and drag it to what you want to mainly focus on, then tap to take a pic. Going forward, there won't be any phones you can talk and do data at the same time on Verizon unless 1. You're in an LTE area and you have advanced calling enabled, or 2. You're have your phone on WiFi. Verizon went to a one antenna system for all their phones starting with I believe the LG G3 or the Moto X 2014. IIRC the Note 4 didn't have the one antenna system, but I believe that was the last one that didn't. So instead of offering those pointless designer models for the XPE, why not offer these instead? Pretty lame considering the old Droid 2 R2D2 edition actually had the body painted like R2D2. They really should do more than slight accents and wallpaper.